We may have glimpsed liquid hydrogen abruptly changing into metallic hydrogen, which is the same stuff in the core of Jupiter. But how and when does this transition from gas to liquid metal occur? How does it behave? In April of this year, Harvard University researchers in Lyman Laboratory observed evidence of the abrupt transition of hydrogen from liquid insulator to liquid metal. It is one of the first times such a transition has ever been observed in any experiment. They published their research in Physical Review B. 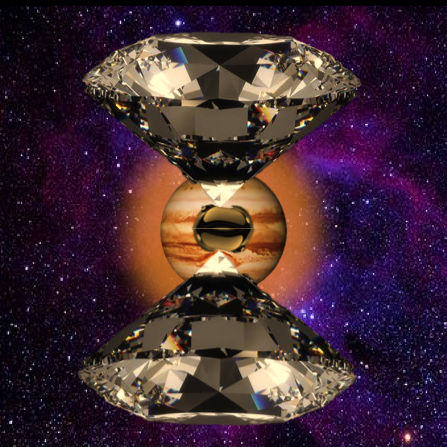 In the earthbound experiment, Zaghoo, Ashkan Salamat, and senior author Isaac Silvera, the Thomas D. Cabot Professor of the Natural Sciences, recreated the extreme pressures and temperatures of Jupiter by squeezing a sample of hydrogen between two diamond tips, about 100 microns wide, and firing short bursts of lasers of increasing intensity to raise the temperature. The transition of liquid to metallic hydrogen happens too quickly for human eyes to observe, and the sample lasts only a fraction of a second before it deteriorates. So instead of watching the sample itself for evidence of the transition, the team watched lasers pointed at the sample. When the phase transition occurred, the lasers abruptly reflected. Metallic hydrogen also has important ramifications here on Earth, especially in energy and materials science.